Mailer app is free to install in the cloud for all account plans. You only pay for the number of emails sent. A license to install Mailer on your own server or hosting (PHP / MySQL). 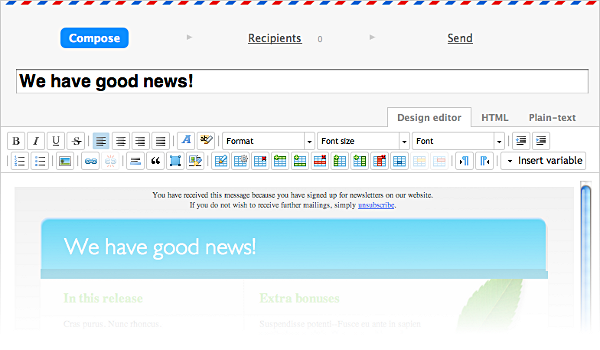 Mailer app reliably delivers email newsletters and notifications to your customers and subscribers. The visual text editor will save you time: it will help you to easily add images, apply desired visual formatting, and embed links to your website in the message text. For professional designing, switch to the advanced HTML-editing mode. The text editor also supports use of variables for dynamic generation of message content. Each recipient will receive a personally addressed message. To avoid suspicion of sending SPAM, add the unsubscription link to your message — with one mouse click! subscribers collected via a web form on your website. If some of your recipients are not included in any of the above listed groups, add their email address in the additional text field; these additional addresses will be saved in the database for future mailings. Click on the "Send" button! When processing the recipient list, the application automatically removes duplicate email addresses and those which have failed during previous mailings; e.g., non-existent or misspelled addresses. Filtering of duplicate and incorrect email addresses helps you to avoid being blacklisted by public mail services. 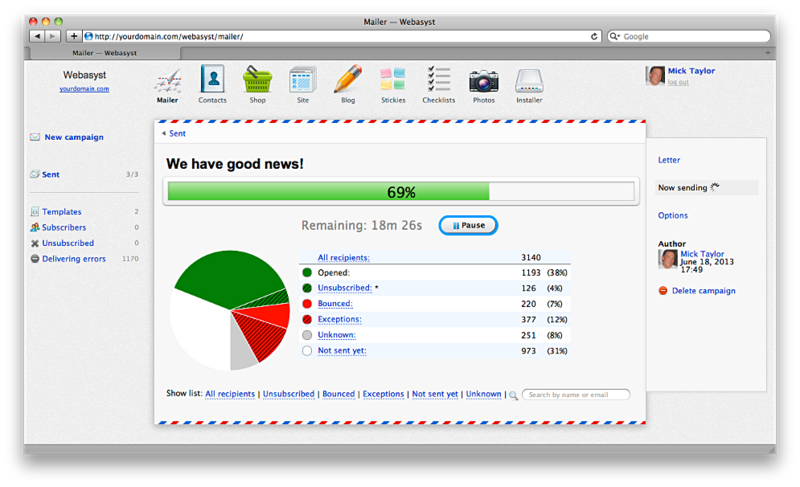 The statistical information about sending and reading of your message is displayed and updated in real time, without reloading the browser page. The running progress bar and detailed breakdown of the recipient list by status (read, not delivered, not sent because of a critical error during previous campaigns, etc.) 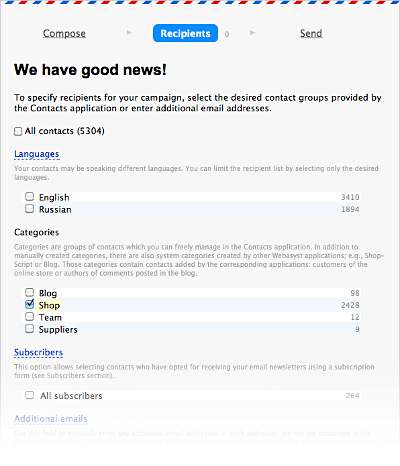 will help you to estimate the remaining sending time and current campaign efficiency. You can pause the running campaign at any time with a click on the "Pause" button and resume it later, whenever you desire. If a very long campaign has been interrupted because of technical limitations of your web-hosting server, the application will automatically resume the process to complete the sending. All you need to do this is to keep your browser tab with the running campaign open or to set up a job scheduler (cron) using our detailed instruction. If there are many users of popular mail services (e.g., Gmail, Yahoo! Mail, Outlook.com, etc.) 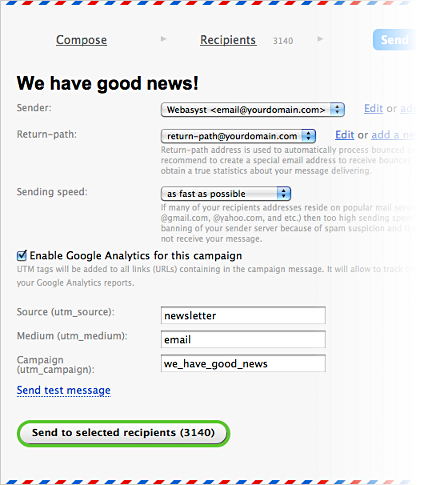 among your recipients you can limit the sending speed to prevent your campaign from appearing as SPAM which is often sent in large amounts within a short time period.